I’ve been thinking a lot about what it means to be brave. I was brave in Chicago, when I gave everything in my being to a marathon that was looming over me for a year. I’ve been summoning every scrap of bravery I have to not fall into depression, which is something I’ve discovered is shockingly easy for me to do when my physical activity is extremely restricted by pain. 2018 is the first year I’ve dealt with chronic injury, and it takes more grit and bravery to deal with the day-to-day of that than any race I could ever train for or complete. But bravery is not confined to the physical body. It takes bravery to have any kind of hope, and hope is necessary to avoid total despair. It’s brave as hell to make art, and to share it, and that’s a theme I’ve noticed in my fall reading. This month I read some hard books. Books about pain, about disaster, about feeling lost and alone. But they all carry hope with the grief and the fear. It takes bravery to read and absorb challenging stories, sure, but I’ve been thinking about how brave it is to write them. To be vulnerable to sorrow and hopelessness, to the overwhelm of the world at large and the fear of inadequacy within. To face the bleak and scary, the ache and the unknown, and do something anyway. Learn about it. Study it. Breathe into it, try to make sense of it, even though you probably never will. That’s what the writers I read this month were doing: being brave. 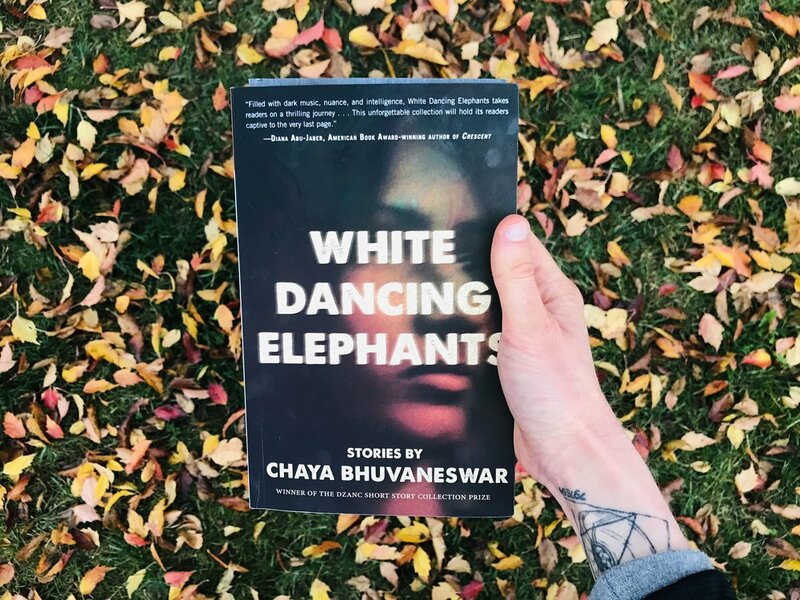 The stories in Chaya Bhuvaneswar’s White Dancing Elephants, the essays in Lacy M. Johnson’s The Reckonings, the memoir All You Can Ever Know by Nicole Chung and the novel Unsheltered by Barbara Kingsolver all sought to get at something hard and true, something scary, yet allowing light to come through. I’ve already reviewed All You Can Ever Know and The Reckonings, so let’s talk about White Dancing Elephants and Unsheltered. The tight, twisty stories in Chaya Bhuvaneswar’s debut collection do something incredibly refreshing and important: they center women of color, mostly Southeast Asian women. There are men here, but the stories don’t pivot on them. To be clear, though, many do pivot on patriarchy. The inner lives of these women – a college student who is gang raped and blames a test-cheating incident, and her white feminist roommate’s crusade on her behalf; a scholar on Southeast Asian studies who has an affair with the husband of the dying woman she’s in love with; an unnamed narrator having a conversation with her miscarried son – are the pulse of the book. In The Life You Save Isn’t Your Own, a female art collector is asked time and again by gallery owners when buying work if there are “Any men? Any at all? " involved in her wealth, her life, her worth. The story comes toward the end of the collection, and this one passage distills the peripheral role of individual men, yet the ubiquitous role of Men, in the characters’ lives. Similarly, in The Orphan Handler, a sister in a convent that takes in orphan girls describes them running away: “[They] ran off once and for all like the unruly girls they were. In order to allow themselves the privacy they deeply craved to become eagles or panthers or wild mares…”, implying the inner power and survival instinct in girls. But the story grows much darker, the animal metaphor becoming a terrifying reality. In Chronicle of a Marriage, Foretold, a woman on a women writers’ retreat in which the participants are housed in caves on an island conjures a borderline abusive, certainly misogynistic, white lover named Harry. Like for all of the women and girls in these stories, agency and oppression are flip sides of the same coin. I had the pleasure of seeing Chaya Buvaneswar read at Elliott Bay Book Company in Seattle, and was struck by her bravery in person, in a different way than the stories in her collection are brave. The stories don’t shy away from creating a sense of unease, of darkness, even terror. I didn’t know how one would approach reading them out loud to an audience. But Bhuvaneswar did so with ease, her voice steady and her face smiling. It was a completely different experience to hear her read her work than to hear my own voice read it in my head, where I often cringed or shrank from fear or sadness. During the Q&A, Bhuvaneswar had a lot of really interesting things to say about craft and storytelling being an ancient and deeply human thing. But what I loved most was how proud she was of this work. And she should be. She is a brown, self-identified queer woman in America. I am white and queer and have an extremely hard time letting go of the harmful things America gave me: internalized homophobia and misogyny, erasure, doubt, self-consciousness. If it were me up there, I thought, I would have to spend all my energy not apologizing for my presence. It was beyond wonderful to see this woman stand proud beside her work, believing it was worth a lot. I agree with her: it is. Ok, so. Full disclosure, I’m not done with this book yet. It’s a brick. I say this with love, as a longtime Barbara Kingsolver fan, but it’s easy to get bogged down in her more tome-like work. It’s been a good long while since I’ve read a Kingsolver book, and a lot has happened in the world and my outlook on it in that time. I think that’s a big reason why I’m still resistant to this book, more than halfway through. Kingsolver is a prose master, and she’s smart as hell. I’ve always loved how she combines poetry and science into epic novels, but this one, despite its high points, feels a little off base. The novel tracks two parallel stories in two time periods: 2016 and 1875 in Vineland, New Jersey, a real town founded to be a ‘utopia’ by eccentric religious fanatic Charles Landis. The protagonists in both stories live in the same house, all those decades apart. It’s already falling apart in 1875, and is still falling apart in the 2010s, when Willa, her Greek husband Iano, Iano’s Trump-loving and very ill father Nick, their 20-something hippie daughter Tig, and unexpectedly, their son Zeke and his baby son Aldus (which never fails to make me think of Albus) live there. They’re a middle-class family: Iano a professor, Willa a formerly-employed-now-freelance reporter, Tig a multi-hyphenate dreadlocked SJW stereotype, and Zeke an aspiring venture capitalist in the tech world. But they’re feeling the squeeze of the disappearing middle class - unable to pay bills, forced to move from their comfortable home to this inherited property in New Jersey for a teaching job for Iano, and unable to keep up with home repair, food, insurance, and medical bills, student debt, etc. Their 1875 counterparts are Thatcher, a science teacher devoted to Darwin’s new theories; his wife Rose; her sister Polly; and their mother Aurelia. The next door neighbor with whom Thatcher strikes up a friendship is Mary Treat, a woman who existed in real life and who is hands down the best character in this book. She’s an endlessly curious scientist, and quirky, making her very appealing to both Thatcher and the reader. I’m convinced she’s queer, mostly because of how awesome and independent she is in a time when female independence was rare (see also: Anne Lister and Willa’s namesake, Willa Cather, for starters). Here’s the thing: I do think Barbara Kingsolver is being brave in writing this story. It’s a tricky time to be making social commentary, because everyone is super on edge re: the dumpster fire that’s happening in the world, and ready to pounce on anything deemed controversial. I admit I am too. But I have a hard time empathizing with the contemporary characters, and sometimes I can’t stand them. Of course, flawed characters are important. But when I read about Willa & Co, who Kingsolver claims are a ‘microcosm of America,’ I can’t help but think: Who’s America? The central flaw in Unsheltered’s narrative is that it is so, so white. I’m not saying Kingsolver, a white woman, needs to write Black stories or queer stories or something, but it’s kind of wild to me that in a story that is about polarization in America, race is barely addressed at all. Kingsolver draws parallels between 1875 and 2016 American divisiveness that would ring very true if she even mentioned racism, patriarchy, and white supremacy. But instead, the 1875 polarization is framed as religion vs. the theory of evolution (rather than the reasons behind the Civil War, which was not 10 years finished in 1874-75). In writing about the present-day polarization that led to the election of 45, she doesn’t address that white supremacy is the undercurrent of all of it. (I would call it white supremacist cis-hetero patriarchy, but same same). Willa and her family’s problems are all about class. The fact that more and more formerly middle class white people are being pushed into poverty by the wealth gap, yet nowhere does anyone acknowledge that race and class are inextricable, is kind of ridiculous for an ostensibly progressive narrative. Even the poorest whites have always enjoyed inherent superiority to Black people and other people of color in America, and class anxiety tied to racism is a huge reason that the 2016 election played out like it did. (Plus voter suppression, gerrymandering, mass incarceration, and other forms of institutionalized racism). All of the characters (with the exception of a Latino side character who lacks depth and fits squarely into stereotypes) are white, and their biggest problem is one they don’t see: The same systems that oppress people of color oppress Willa, Iano, Thatcher and Mary. Landis’ ‘utopia’ was never meant to be for everyone. The American Dream that Willa, Iano and Nick believed they would achieve if they ‘did everything right’ was only ever for white people, and in the end it’s not a real thing. That said, regardless of how I feel about the content of the book, I can’t help but kind of adore Barbara Kingsolver when it comes to craft and storytelling. Her sentences sing, and it’s clear she puts a ton of work into her writing, which is a gift to see. I recently was lucky enough to see her speak at Seattle Arts and Lectures, and while the discussion around Unsheltered more or less reinforced my ideas and opinions about it, I loved hearing her talk about the process of gathering research about Vineland and Mary Treat. Treat was a frequent correspondent and friend of Darwin, even conducting experiments via mail (!) with him. She wrote lots of books and articles on natural history and seems just as interesting in real life as she is in the book, though sadly mostly erased from history. I wish I could read a whole book just about her. (Who needs Thatcher? Not me). Kingsolver also offered a lot of gems about the practice of writing and reading, like how she reads poetry every night before bed because it ‘flosses the word-loving parts of my brain.’ I also loved her personal stories about agricultural life and studying biology (as a former MSc student and farmer myself). Hope isn’t something you have, like left-handedness or a heart murmur. It’s an energy you access in order to do something. We use it until it’s used up by the end of the day, and the next day we pull it back on with our shoes and we go out and wear it. I will likely finish Unsheltered at some point, but I’m putting it aside for now because my time is precious and there are so many more books sitting in piles in my house that feel more urgent. Sometimes it’s brave to write about controversial things; sometimes it’s brave to put books down you want so badly to love. That’s it for this month, thanks for reading! Have you read any of these books? Please let me know your thoughts! Note: I received a free copies of all of the above books from the publishers, but opinions are my own. 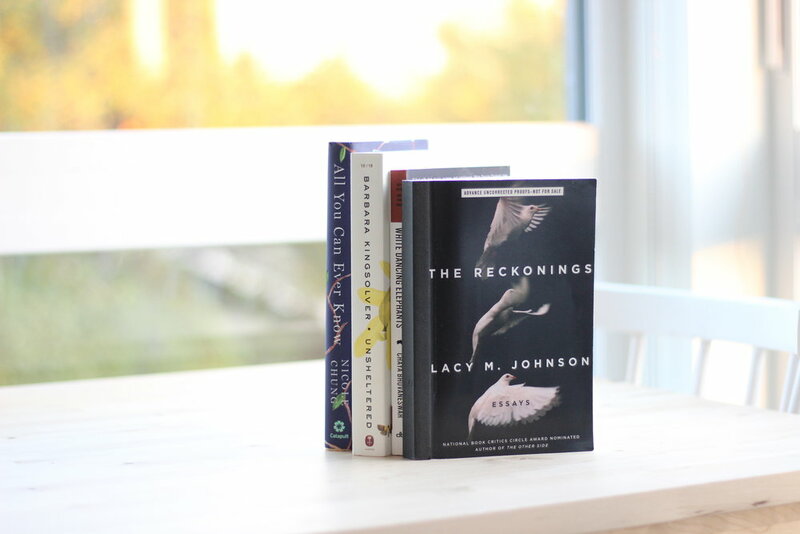 I am a Book Depository affiliate; if you decide to purchase any of the books I review via the links provided, I will receive a (very small) commission.